Find your local advisor and start your financial planning today. Financial planning for families and individuals. Good Life Financial Advisors started in 2012 as a means to provide independent objective advice to families, individuals, and businesses in Berks County and beyond. Founder Conor Delaney and Co-Founder Courtnie Nein have since developed a national footprint with advisors located all around the country serving the needs of Middle America. Conor and Courtnie are relationship centric and have a core focus on developing strategic financial plans with each of their clients. With access to independent advice, a combined 20-plus years of industry experience, and an energetic team, Good Life Financial Advisors remains one of the premiere financial advisory firms in the area. Conor Delaney and Courtnie Nein of The Good Life Companies came together at their prior broker dealer back in 2007. Courtnie, a native to Berks County, Pennsylvania and Conor Delaney, a native to Monmouth County, New Jersey have built and maintained a practice committed to a high level of client service for the individuals, families, non-profits, businesses, and organizations which comprise their client base. Conor and Courtnie left their prior broker dealer to create their own firm with its own unique culture and identity. Good Life Financial Group was established to continue to provide the high level of service their clients have come to expect from the two founders. 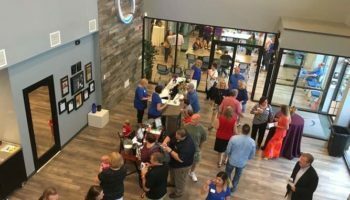 It was also established to serve as a place where other advisors in the community can move their practice and become part of the Good Life culture. At the heart of all of Conor and Courtnie's recommendations for their individual clients is a strategic plan. They recognize everyone has their own unique situation and set of circumstances. As Financial Advisors, Conor and Courtnie take each of their clients through the financial planning process to determine the most appropriate strategies and services to fit their needs. It is only at the conclusion of doing the plan that they will make actual recommendations. They specialize in wealth accumulation planning and risk management. They are also experienced working in the retirement plan and non-profit endowment/surplus fund arena. They provide support for several 401(k) and Simple IRA retirement plans for companies and organizations ranging in all sizes and industries, including medical, manufacturing, real estate, restoration/construction, and software design. Their value proposition to each of these companies is individual meetings with each employee, or the board, to determine risk tolerance and set forth an actual investment strategy for the funds. Delaney's motto is always "Family Comes First." He puts a contingency on that though because so much of his success in business has been centered around people who have become like family to him. A New Jersey native, Delaney moved to Pennsylvania full time in 2005 following the premature death of his father. In doing that, the closest "family" was over two hours away. Eight years later, he says that 90% of the people he interacts with on a day to day basis, regardless if clients, colleagues or community leaders, are like extensions of family to him. Delaney married his college sweetheart, Liz, in 2008. They have three children, Blake Seraphina, Rhys Brian and Elena Rae. They enjoy distance running as a family and spending time with their brothers, sister, and nieces in New Jersey. Delaney is also a volunteer board member at the YMCA, and an active participant in the Lions Club, Greater Reading Chamber of Commerce and the Alvernia Alumni Association. Courtnie married her long time love, Justinn, in September 2009. They have two sons, Graham and Colt. Courtnie enjoys working out, watching Syrause sports, hiking with Justinn and their cattle dog Dexter, and spending time with friends and family. She also enjoys cooking in her free time. Courtnie is president-elect of the Spring Township Rotary Club, is on the board at the YMCA, and is a participant in the Greater Reading Chamber of Commerce. Merra Lee believes financial planning is about a person's values, no just their money. Her focus is on seeking to protect your purchasing power, not simply the principle. She feels it is important to develop the right retirement plan for your situation using techniques to manage taxes, access to money, market volatility, and adverse possibilities. Merra Lee loves to travel with her husband, Patrick and have traveled to more than 30 countries. Sadly, she can't take her pooch, Chica. Patrick and Merra Lee have two college graduate sons. Since 2005, Brad has offered comprehensive financial planning to businesses, individuals and families. Understanding clients’ current issues and focusing on future goals are the building blocks to servicing his clients’ needs. Strategic asset management, education planning, retirement planning, and estate planning are specific areas of expertise. Brad utilizes the financial planning process to drive recommendations that his clients can use today and use for tomorrow. Brad received a B.A. degree in Finance and International Business from Pennsylvania State University, University Park, Pennsylvania. He holds the Series 7 through LPL Financial, and 66 through LPL Financial and Good Life Advisors, LLC., as well as the College for Financial Planning Chartered Retirement Planning Counselor (CRPC) designation. In 2013, Brad earned the Accredited Investment Fiduciary (AIF) designation. He is also licensed to sell and advises clients on life, disability, health, and long-term care insurance. Brad currently resides in Wyomissing, Pennsylvania with his wife Tricia. In his personal time, Brad enjoys traveling, hiking, hunting, fishing, golf, and Philadelphia Phillies baseball. Noah Brooks joined The Good Life Companies as a Financial Advisor in 2012 before being promoted to Director of Investments for Good Life Advisors in 2014. 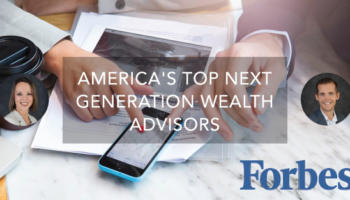 Mr. Brooks was tasked in 2014 with creating a program for advisors to have an in-house platform for their asset management needs so, if desired, the advisor can focus on grown and retention. He works directly with the professional partners to develop and create sustainable portfolios for Good Life Investment Advisor Representatives. Mr. Brooks developed Good Life's Wealth Allocation Models (WAM) as well as the investment policy statements for both the department at Good Life as well as for each model at the firm. Prior to joining Good Life, Noah was a Senior Financial Advisor at Wells Fargo. Noah began his career at Prudential Securities, beginning his career working directly on the execution/analytics for his Prudential Securities office. In the first half of a career spanning more than 30 years, Dave ascended from Staff Accountant to Controller with various types of companies. In the Millennial Year, feeling the need to change focus and having strong desire to improve the financial lives of individuals, Dave started his advisory practice with MetLife. Then, after 13 years with MetLife, Dave decided to become an independent advisor with Good Life in order to better accommodate client's financial needs in a changing investment and insurance environment. Scott began his career in 1988 as a Financial Advisor with Prudential Bache Securities in Reading, PA where he developed his fundamental investment knowledge. Scott was a founding partner at Berkshire Capital Management in Wyomissing, PA, gaining the skills of profit and loss management. 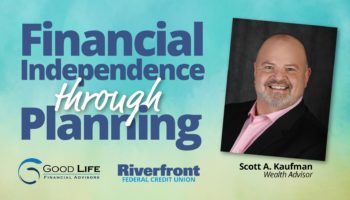 After 7 years of working for Wells Fargo Advisors, Scott recently decided to join Good Life Financial Advisors in order to take a more team-oriented approach in providing financial advice. Scott spends his free time with his wife Sharon, and son Daniel. They love to travel and are very active and passionately committed to helping the local community and beyond. Having grown up, lived and worked in Berks County most of his life, Scott feels very connected with the community. He is a graduate of Penn State University, graduating with a B.S. in Marketing. Kevin Cavanna holds an MBA from Alvernia University in addition to a B.S. degree and A.S. degree from The Pennsylvania State University. He is a Navy veteran who trained at The Naval Special Warfare Center in Coronado, CA and The Navy and Marine Corps Intelligence Training Center in Dam Neck, VA. He is also a graduate of the U.S. Air Force Law Enforcement Academy in San Antonio, TX. He worked as an Intelligence Specialist on a NATO base in Greece both pre and post 9/11 where he held a TSSI Clearance (Top Secret with access to Sensitive Compartmentalized Information). He holds various securities registrations and insurance licenses in addition to being a Certified Retirement Counselor. Kevin is also an active member of the Spring Township Lions Club. Kevin began his career as a Financial Advisor with Wachovia Securities, where he originally developed his fundamental investment knowledge. Over the years, Kevin molded his practice into one that provides highly personalized financial and investment advice for individuals, families, and small businesses. He prides himself on providing a high level of service for a limited number of clients that fit certain demographic and asset criteria. Kevin tailors his advice depending on each client’s unique needs, goals, and expectations. He addresses their financial concerns and develops strategies by focusing on each individual’s specific requirements. He articulates his strategies and investment decisions in a way that his clients can clearly and easily understand. With extensive experience throughout major shifts in the markets, Kevin has dedicated his career to delivering the personalized investment planning services that his clients deserve. Kevin traveled extensively during his time in the Navy. This further helped him understand different cultures and economies. He was stationed in Greece when they switched from the Drachma to the Euro, and learned about international currency markets first hand. While his time in the service instilled military discipline and ethos, it also further solidified him in the Navy’s core values of honor, courage, and commitment. Mick started business life in the US Marine Corps in 1976. After doing 6 years as a Radar technician working on F-4 Phantom II jets in the Persian Gulf, he became a Pizza Hut Manager while attending Penn State for his Electrical Engineering degree. In 1991 he found himself working for Exide, Inc. in Reading, PA. After being promoted to Warranty Administrator, he started his career in the Industrial Battery Market where he handled technical training and helped pioneer and champion a new segment of data collection for the Industrial Battery Industry and Exide, which was to go through numerous name changes such as Yuasa-Exide, Yuasa and finally Enersys. Mick left Enersys in 2009 and went back to college to finish his Bachelors Degree in Technical Management and went on to complete his Masters in Business Administration. While finishing his Master’s Degree, Mick worked for Aker Wade Power Technologies in Charlottesville VA. In 2016 he decided he wanted to follow his true calling as a Financial Advisor by joining Morgan Stanley. 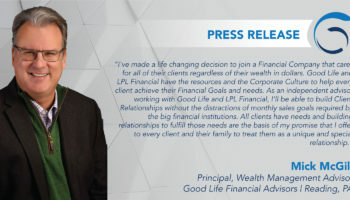 In October of 2018, Mick made the decision to become an independent Wealth Management Advisor and was impressed by the philosophy of Good Life Financial Advisors. As his own boss at Good Life, he no longer has a monthly quota in order to make another business wealthy. His ultimate goal has always been to develop long-term relationships. He first seeks to understand his prospects present needs and their ultimate future goals, whether they want to save for retirement, their children or grandchildren’s college or their Long-Term Health or Estate funding needs. Being personally involved in someone’s financial decisions allows him to develop enduring friendships, which is his personal goal for every relationship that he start with new clients. 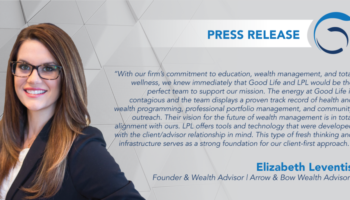 Good Life Financial Advisors is a community-first financial services firm that values customer relationships and achieving the highest level of customer satisfaction. Securities offered through LPL Financial, Member FINRA/SIPC. Investment advice offered through Good Life Advisors, LLC, a registered investment advisor. 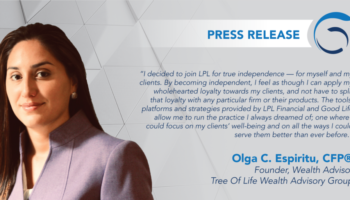 Good Life Advisors, LLC and Good Life Financial Advisors are separate entities from LPL Financial. The LPL Financial Registered Representative associated with this site may only discuss and/or transact securities business with residents of AK, AL, AR, AZ, CA, CO, CT, DC, DE, FL, GA, HI, ID, IL, IN, KS, KY, LA, MA, MD, ME, MI, MN, MO, MS, MT, NC, ND, NH, NJ, NM, NV, NY, OH, OK, OR, PA, RI, SC, SD, TN, TX, UT, VA, VI, WA, WI, WV, WY.